The Celtics were dealt a devastating blow this past weekend, as star point guard Rajon Rondo suffered a torn ACL in his right knee. While Boston now must scramble to replace their floor general and best playmaker, the Eastern Conference All-Star team now has a big hole to fill in its starting lineup as well. With Rondo done for the year, either Kyrie Irving or Jrue Holiday, who were each named to the All-Star reserve team last week, will presumably step into Rondo’s place in the starting lineup. 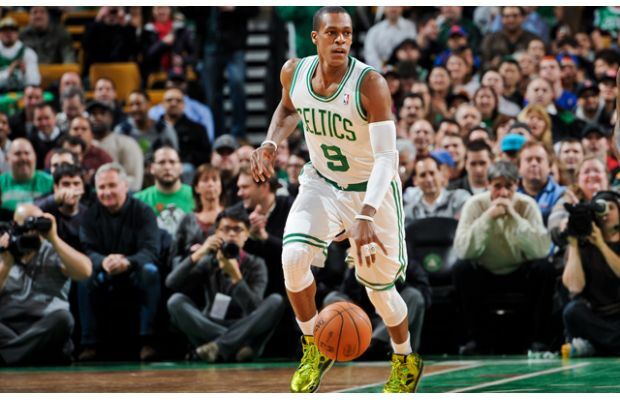 Both have played very well this season, and either would be worthy of the starting nod now that Rondo is sidelined. The bigger question now is who David Stern will pick to replace Rondo with on the 12-man roster for the East. If he chooses to pick another guard, some of his choices could include Brooklyn’s Deron Williams, Milwaukee’s Brandon Jennings and perhaps Indiana’s George Hill. If Stern feels comfortable with the current backcourt of the East, he could decide to go with another frontcourt player. Nets’ center Brook Lopez is the most glaring omission from the Eastern Conference, so it would make a lot of sense to reward him with his first All-Star appearance. Other big guys who could merit consideration include Detroit’s Greg Monroe, Chicago’s Carlos Boozer, Indiana’s David West, and either one of Atlanta’s outstanding frontcourt duo of Josh Smith and Al Horford. However, if Stern decides to add another big guy to the mix, it should be Lopez. Of course the primary concern for fans has to be the long-term health of Rondo, and Boston is now at a crossroads in its season. But Celtics fans are not the only ones affected by this, and the All-Star Game will certainly have a different feel with Rondo no longer part of the mix. This entry was posted in NBA Tickets and tagged all star game tickets, nba all star game, nba tickets by promc58blog. Bookmark the permalink.